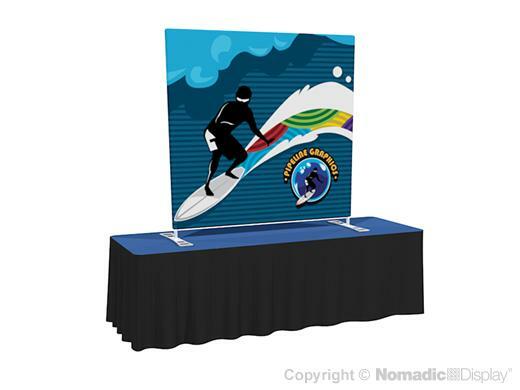 This FabLite table top is a gem for trade shows, traveling sales reps, HR recruiting events and seminar sponsorships. It offers big graphic impact because the frame is completely hidden. Like all Nomadic printed fabrics, the graphic is custom-tailored for a wrinkle-free fit and finish. FabLite travels in its own padded shoulder bag and sets up fast without tools. The frame snaps together with push button ease. Simply pull the liner and dye sub printed fabric graphic over the frame like a pillow case and zip the end. In minutes you are ready to show. FabLite frames are covered by the industry’s best lifetime warranty. 1 - Fabric Carry Case - 12" x 38" x 5"